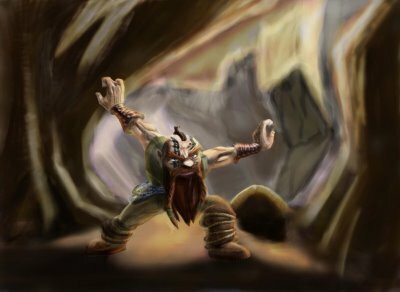 GRIMM is monk of dwarven descent he's 4' tall and about 140 lbs about 25 years old not sure date of birth due to being left at in a temple in mountains as a baby and Not sure of his family past . while living a life in a place of discipline , Grimm followed his masters in the art or fighting all the time feeling some thing missing .his quest is to find his place in the world while he masters his strength and kei powers .Grimm has taken the vow of truth, he feels this will help him find the truth of his past .on this adventure he has taken up with a group of adventures that so far shown good nature while trying to make a name for them self and helping locals out . Maybe Grimm won't find his past but he will make a future. he has made friends growing up and has decided to travel with them into lands littered in story's and folk lore.